As airplanes have gotten larger and larger, and the power systems running them have advanced to meet the needs of the modeler, the question often still comes up, "how much capacity do I have left in my batteries???" In the past, pilots would resort to volt meters, loaded gauges, and estimation in an attempt to figure out the amount of power consumption their model was using and how much capacity they actually had left in their batteries to safely fly on. The need grew greater with the introduction of A123 battieries and their inability to be load-checked between flights with trusting results. Seeing the need, PowerBox Systems, whose products are sold and distributed by Duralite Flight Systems, have once again developed a product to meet the ever-growing needs of the moderler! Enter, the PowerBox Baselog! The PowerBox BaseLog comes nice packaged and protected within bubble-wrap in sturdy box protecting it from the elements, as well as the rogue delivery man. 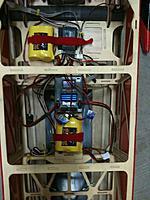 The basic attachment provisions are included to adapt your batteries to your unit as well as the basic essentials to get the system mounted and functioning in your giant scale model. Complete directions (although they really arent needed), are available directly on Duralite's website, as well as from PowerBox. 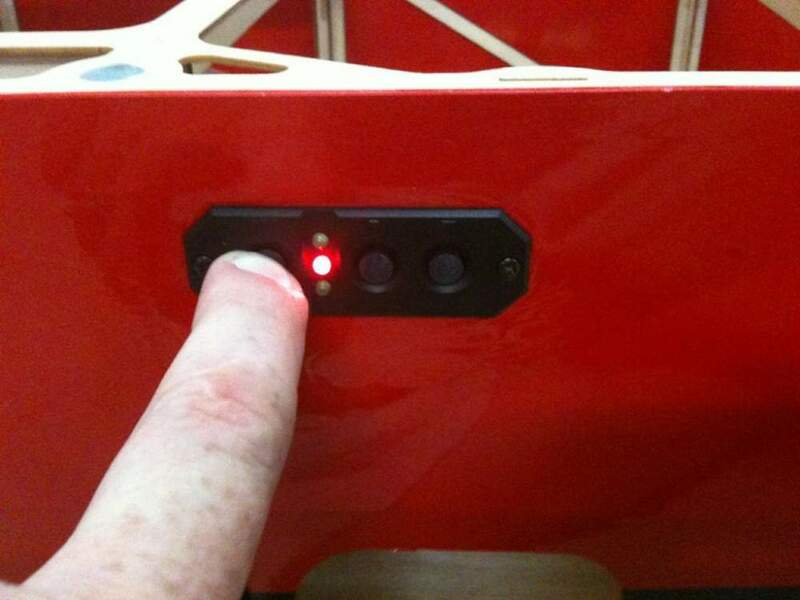 Once removed from the shipping box, it is a simple installing with 4 wood screws to tie it in to your airframe, and 5 electrical connections (including the switch) to get you up and running! 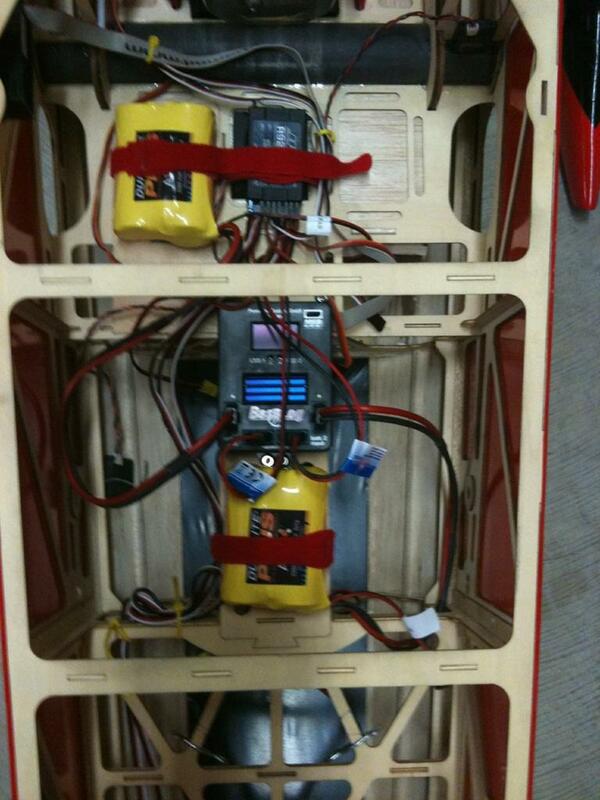 Function: The PowerBox Baseliog completes several functions in your giant scale airframe. The Baselog has built in regulators that have the ability to regulate the voltage of your Li-Ion or Li-Po packs while maintaining true redundancy with each regulator capable of handling up to 20 amps of current. 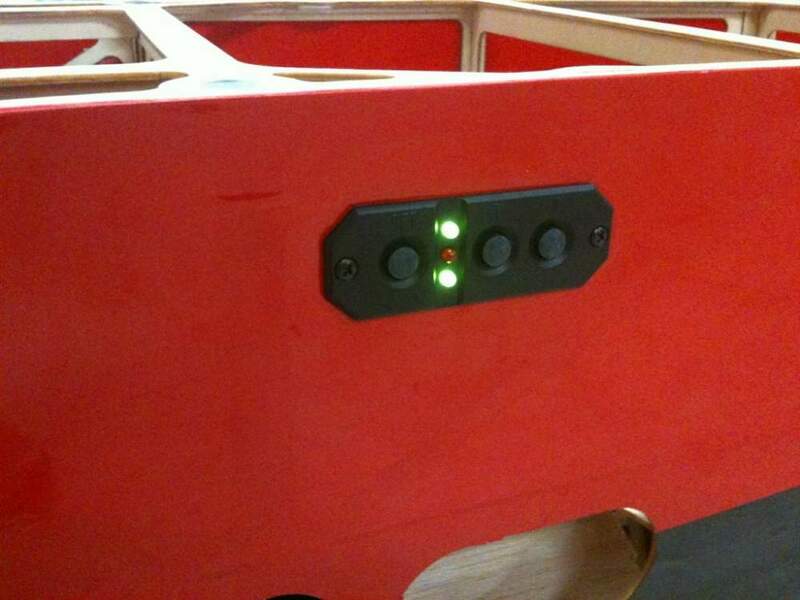 When running dual batteries within your application, you are able to independently power up each pack through PowerBox's unique SensorSwitch that allows you to arm the system, and turn on each individual pack independently, preventing from accidental turn-ons resulting in dead or depleted batteries. 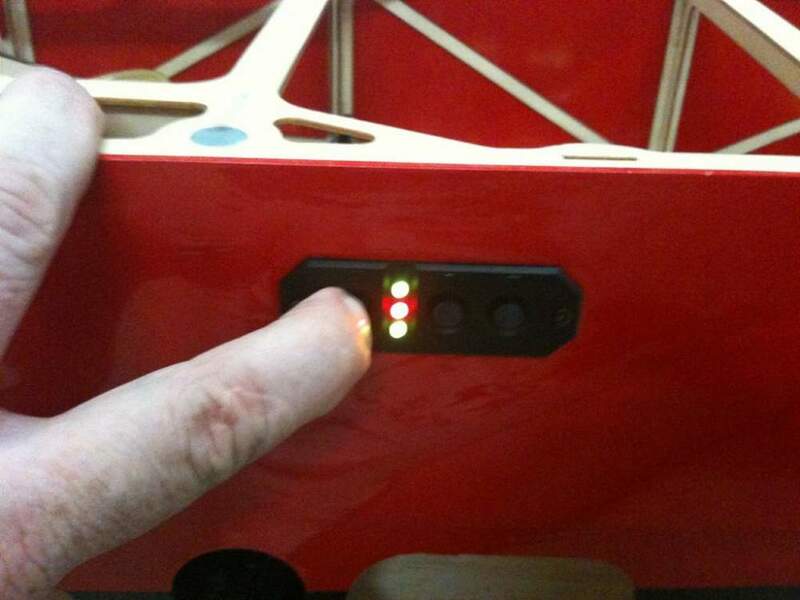 Secondly, the BaseLog allows you to completely monitor the consumption of your packs within your airframe! How does it do this you ask? 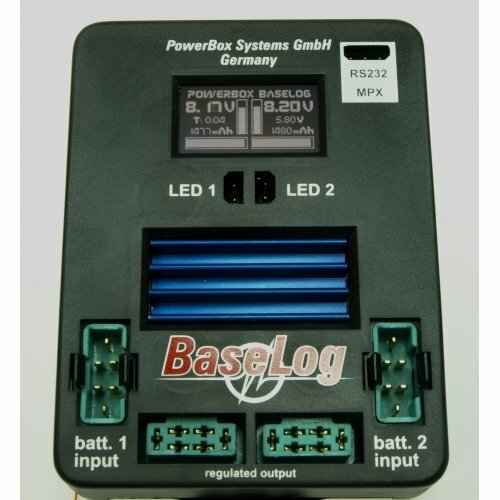 With the built in programability of the BaseLog, when coupled with the included SensorSwitch, you are able to scroll through the BaseLog's programming to select not only the battery type you are using, but the capacity, as well as change the voltage regulation, or turn off regulation all togethor! Why would you want these functions you ask? By programming in the chemistry and the capacity of your batteries, the BaseLog is able to closely monitor your consumption of each pack and clearly display it for you to see on a bright LED monitoring screen. By telling the BaseLog what the capacity of our batteries are, it will visually display both in text, and in a bar graph what we have left in our packs after each and every flight based on the milliamps your airplane consumers. 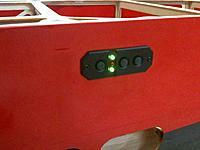 This completely eliminates the guesswork when it comes to monitoring battery capacity! The base Log also visually displays each packs voltage, output voltage, and run time that you have had on the system giving you full functionality as well as redundant monitoring methods for you to keep track of where you are during a busy flying day or competition. When you recharge your packs, a simple press of the buttons on the SensorSwitch once powered up will reset your consumption meters and graphs and allow for accurate results and displays each and every time! Once installed and utlized, you will no longer have to guess, or check your batteries. 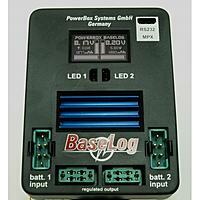 The information you are looking for will be clearly displayed for you to view on the front of your PowerBox BaseLog! The BaseLog has also taken into account the future telemetry development that is still on its way to us, that once it comes available, will support to function to send the information that the BaseLog is monitoring directly to your transmitter! 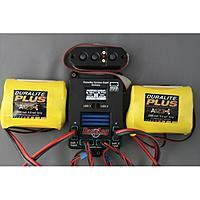 PowerBox, distributed and sold by Duralite Flight Systems, has done it once again when creating a product to meet the ever-expanding needs of the R/C modeler! The PowerBox BaseLog allows users to not only regulate their batteries through a completely redundant and compact system, but it also allows for complete monitoring of the consumption of your batteries to create care-free flying, free of the fear of how much capacity you have left in your packs today. When it comes to outfitting your next bird, leave your power regulation, distribution, and monitoring up to PowerBox, they have got you covered in a safe, reliable, and proven product! Right now https://duraliteflightsystems.com/ is running a summer sale on FIVE of their Powerbox systems! Check it out and save some money! In a nutshell, instead of having switch to count your mah spent, especially critical with your A123 packs, this offers regulators or you can by pass them when using A123 plus mah spent and some other features! So if you were to buy two regulators for your plane, this not only will take the place of those two regulators but also will show you how mah you have spent which will help you in using most of your battery before charge! Last edited by Reza; 09-30-2010 at 04:36 PM. I think you meant to say that the function of this product is "Dual regulated constant voltage" to your receiver and servos, at the same time, BASELOG accumulates the stats for your batteries, Such as minutes/sec ..(time), Number of milliamps used, Displays the banks (Port 1 battery ) (Port 2 Battery) and the usage. As you can see in my JET in the Video i m running the BASELOG. In a nutshell, instead of having switch to count your mah spent, especially critical with your A123 packs, this offeres regulators or you can by pass them when using A123 plus mah spent and some other features! So if you were to buy two regulators for your plane, this not only will take the place of those two regulators but also will show you how mah you have spent which will help you in using most of your battery before charge!